As a young teenager, Tessa Kover was both intrigued by Madelyn Beecher being “simultaneously cautious and careless” and rejecting of her for being needy and “weird.” In what ways could you identify with Tessa? With Madelyn? Madelyn Beecher Baron’s upbringing impacted her later life decisions. How have your upbringing and your family affected your decisions? What messages or beliefs have you had to overcome? What values or beliefs from your childhood have worked well for you? Madelyn and Tessa both return to New Bern after being gone for many years. Madelyn returned resentfully because she had nowhere else to go and no other way to live. Tessa moved back to fulfill a dream. Have you ever left a place or situation that you later returned to for one reason or another? How did you feel about returning? How did the return work out for you? Madelyn proves she’s determined, resourceful, and courageous, but she doubts her worthiness, intelligence, and contributions. New Bern residents, especially Tessa and Jake, help her see she matters. What are some of your strengths? What are some of your challenges? How have family or friends helped you see yourself differently? How have you supported others to see themselves differently? Financial struggle and fulfilling a dream play key roles in Threading the Needle. How has financial struggle led you in a direction you might not otherwise have considered, like Madelyn? Describe a time you had to defer or give up a dream, like Tessa, because of finances. How did this change in direction work out for you? Tessa’s mother used to say, “Enough is as good as a feast.” How do you feel about “enough”? Is it a feast for you, or do you aspire to more than enough, and why? Jake Kaminski, rumored to be a ladies’ man, shares his story of recovery from alcoholism with Madelyn, and he offers her unconditional support. Why does he do this? How does this help Madelyn? Jake tells Madelyn, “You know, Madelyn, it’s the easiest thing in the world to tell somebody what they want to hear, but it takes a real friend to tell somebody what they need to hear.” Do you agree? Why or why not? Have you ever been in a position of telling a friend something the friend didn’t want to hear? What was the result? How did it affect your friendship? Many of the characters in the Cobbled Court series own a business. If you could start your own business, what kind of business would that be? What do you think are the benefits and challenges of working for yourself? Do you think your personality is suited for being a business owner? Why or why not? Thinking about the failure of her retail business, the first time Tessa had failed at anything, Tessa says, “Maybe that’s the lesson in all of this: Stick to what you know, color inside the lines.” Do you think this is depression talking, or has Tessa’s business failure changed her attitude, her outlook on life? Have you ever failed at anything, and if so, how did it change your attitude, your approach to life? Your willingness to take on new challenges? When Tessa was younger, her mother advised her to “Enjoy the little things in life, Tessa. One day you may look back and realize they were the big things.” Do you think that is true? If so, what little things in your life have you realized are truly the big things? Madelyn realizes after opening her bed-and-breakfast, which so many New Bern residents supported, that, “This is what it’s like to be part of something, of some place. This is what it’s like to care.” What have you been part of that’s been meaningful to you? In what ways have you cared for others? Madelyn finds her childhood quilt in the Beecher Cottage attic. Tessa pays to have it repaired, and then the quilt end up on one of the beds in Madelyn’s bed-and-breakfast. Discuss the symbolism of quilting in the story and to its characters. 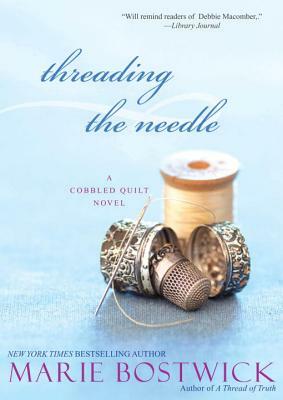 Near the end of the book, the quilters decide to make a baby quilt for Angela, who was also betrayed by a man. What’s the significance of this scene?